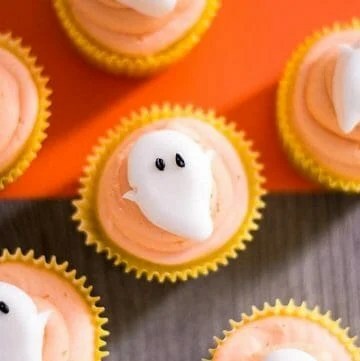 Ghost cupcakes with a vanilla cupcake, pale orange frosting, and a cute little fondant ghost topper. 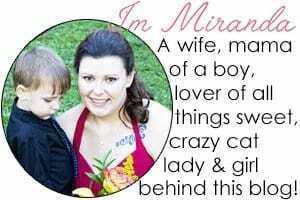 They’re so simple to put together and everyone loves them. 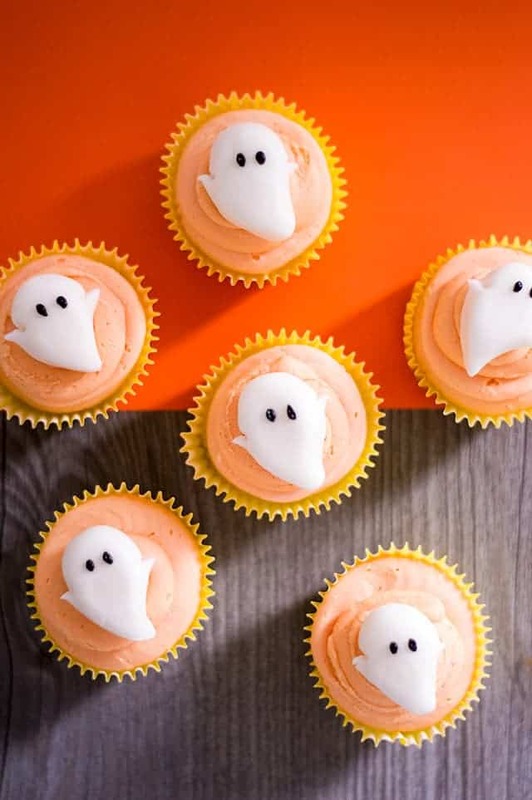 Who doesn’t need a fun, easy Halloween dessert idea to throw together with their kids? Halloween is my favorite. Bring on the scary movies! You can make nasty, creepy looking desserts or cute whimsical desserts for Halloween. It all depends on who you’re making it for, right? In this case, these would be a winner for a kids Halloween party. The cupcakes don’t require any fancy piping skills or techniques. 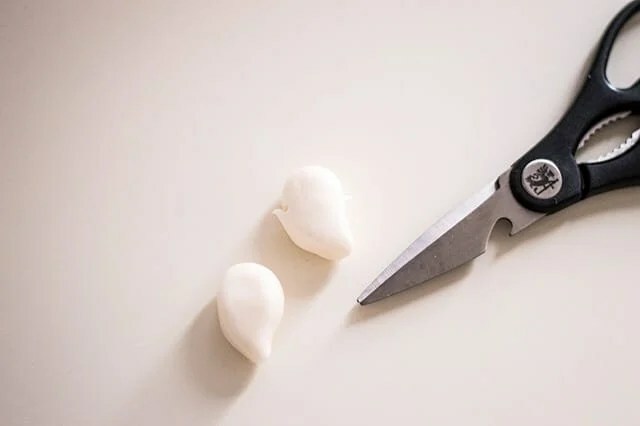 The ghosts are basically little teardrop pieces of fondant with black oval eyes and small Kirby arms made by cutting a small notch on either side of the teardrop. Did anyone get the Kirby reference? When I was a kid, the neighbor boys had a Kirby video game. You know, back when gaming systems just came out and all. I’m really not up on the new gaming technology and I’m not anxious to get my 7-year-old hooked on it just yet. 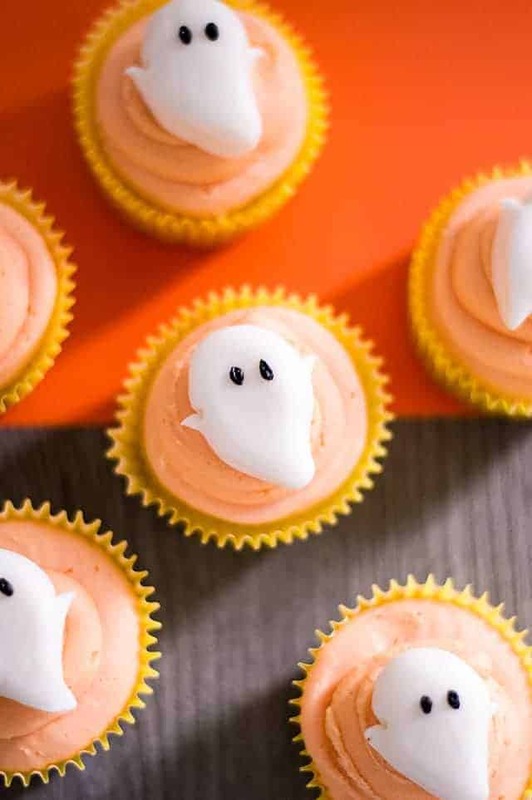 These ghost cupcake toppers are made with fondant. You can also make them with modeling chocolate. I’ll be posting a how to make modeling chocolate hopefully next week for the people interested in that. To start forming your ghost shape, roll it into a ball shape between your two palms. Try to keep the fondant as smooth as possible. Flatten the fondant ball out to become oval and then to make the pointy bottom, pinch the end slightly. Then, bend the pinched end up to give it a curve. With scissors, snip a little portion of the fondant on each side to make arms. Place gently on wax paper and draw two eyes with black frosting or a black food color marker. 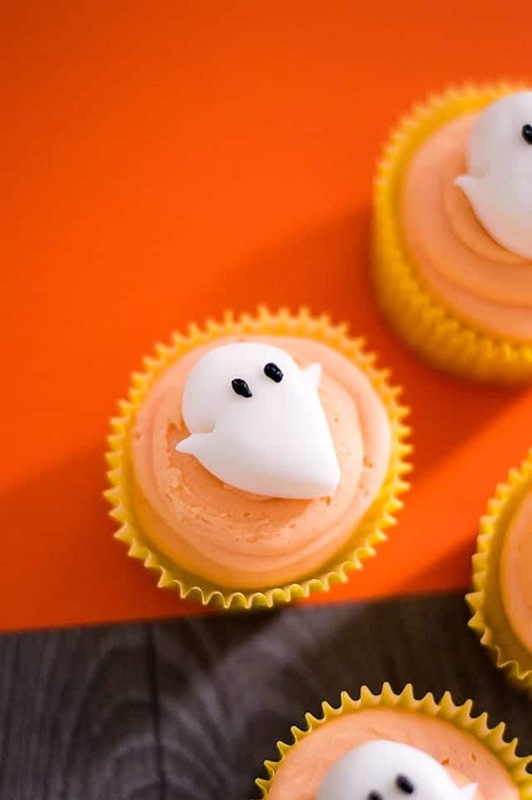 For this ghost cupcake recipe, you can use your favorite vanilla cupcake recipe or a box cake mix. It really depends on what you want to make. I used a box cake mix and the kids had no idea. So whip up the cupcakes according to the box or recipe that you’re using. Let them cool completely. While they’re cooling, work on making the frosting. The frosting is homemade because let’s be honest, the canned frosting just doesn’t compare to homemade. Color your frosting orange either using an orange gel paste color or a combination of red and yellow. Add the frosting into a piping bag fitted with a straight tip or even a coupler. You or the kiddos can pipe a nice swirl on top and add the cute little ghost in the center of it. Preheat oven to 350 degrees. Line a cupcake pan with yellow cupcake liners. In a large mixing bowl, add in the yellow cake mix, water, vegetable oil, and eggs. Beat with a hand mixer on medium until incorporated. Fill the cupcake liners 3/4 full with the cake batter. Place into the oven and bake for 15 to 20 minutes until done. Insert a toothpick and if it comes out clean or with moist crumbs, the cupcakes are done. Let the cupcakes cool completely. Work on making the ghost toppers and frosting while waiting. Line a baking sheet with wax paper and roll your white fondant into 24 1-inch balls. Continue to roll the fondant until it's completely smooth. To start forming your “ghost” shape, flatten the ball out to become an oval and then pinch the end slightly. Then bend the pinched end up to form a curve. With scissors or a sharp knife, snip a little portion of the fondant on each side to form arms. Using a black food coloring marker or black frosting, draw two oval eyes. In a mixing bowl, add in butter, sugar, milk and 2 drops of red gel food coloring and 2 drops of yellow. Using a hand mixer, beat on low and gradually increase to high. Add the frosting into a piping bag fitted with a straight tip or coupler. 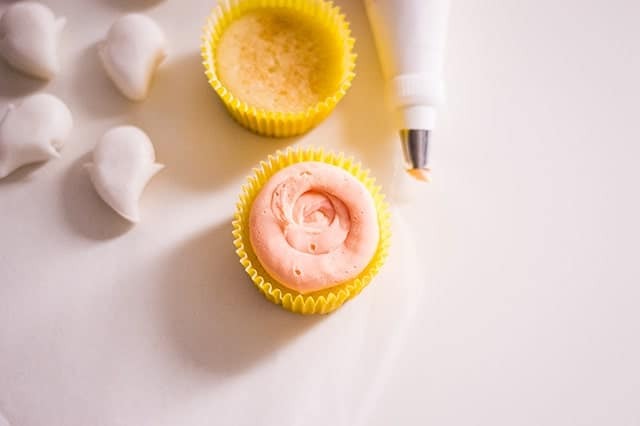 Add a swirl of frosting to the top of each cupcake. Place your fondant ghosts on top and serve. These are too cute!! Perfect Halloween treat!